What is it with pineapples? No longer happy with their natural place growing in dirt or sitting in fruit bowls or refrigerators they're now appearing in artworks and decor pieces in shops, homes and catalogues around the country. 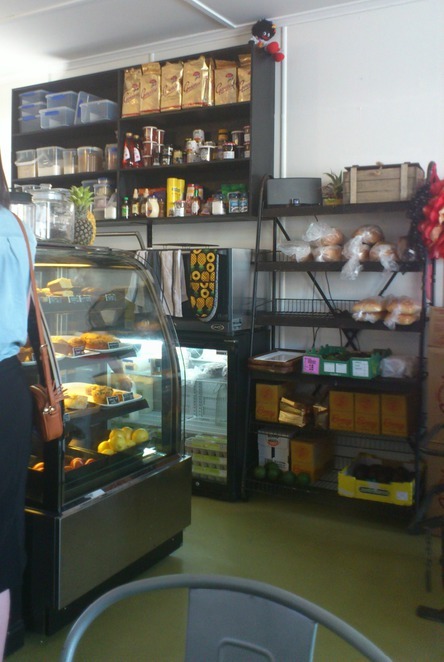 I've recently discovered one of their better modern incarnations — Ananas Espresso, a cafe, no less — down an unassuming side street in suburban Graceville. I have to say up front that I think the name change from the establishment's previously enigmatic moniker, Careful My Tummy, is a winner. Ananas (pronounced AH / nah / nahs) means pineapple in Italian, French, Spanish and other languages and is a symbol of hospitality. Ananas Espresso is indeed a sweet treat, if an unlikely one. It's a word-of-mouth discovery because you could literally blink and miss this hole-in-the-wall establishment. And that would be a shame. The cafe has the homey, vintagey, industrial vibe common to lots of cafes, without overdoing the quirkiness — or the pineapples, thankfully (though if you look carefully at the photo on the right you will find a couple of them lurking!). Timber bench seating with colourful, tropical cushions is mixed with cool, vintage stools and replica Tolix chairs. You'll find retro tableware and wooden boxes storing glasses and accessories. In a nice touch menus are presented on vintage clipboards. There is outdoor seating and what was a tiny indoor space when we visited has since expanded into the shop next door, granting some much needed extra seating. And the place is always buzzing with customers so there are encouraging signs that the local clientele have welcomed Ananas to the thriving Graceville dining scene. As usual, I was with my breakfast 'partner-in-dine', Designing Daughter, and on the lookout for a delicious, not too pricey breakfast. The menu is simple, short and sweet. It includes the usual suspects such as toast (sourdough, turkish, thick-cut fruit), muesli, scrambled eggs, and a good looking BLAT (bacon, lettuce, avocado and tomato on Turkish bread), which I watched another happy diner devour — surreptitiously, of course. warm spices ($12), which sounds like just the thing to savour in the cooler months. 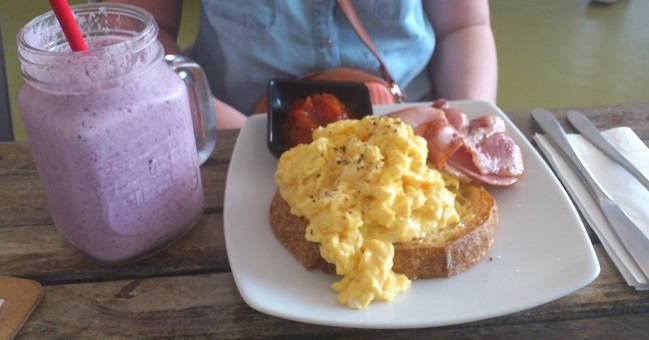 Scrambled eggs and berry smoothie. Unfortunately for all you coffee addicts out there I can't tell you what the coffee is like. We often pass on the coffee and opt for something a little different in the beverage line, and since the day we visited was extremely hot we decided to try something cooling instead. Designing Daughter loved her thick and satisfying mixed berry smoothie ($8) and my caramel milkshake ($6), served in a dinky small milk bottle, certainly hit the spot. I do know that their coffee is the highly regarded Genovese blend and that their barista, Syndee, recently won a Brisbane barista competition, so I think it's safe to infer that they're doing something pretty good in the coffee line. Ananas Espresso is only open for breakfast and lunch: Monday to Friday from 6am to 2pm and Saturday to Sunday from 7am to 1pm. Apart from the regular menu items you can also indulge in some of the housemade special treats you'll find in the glass-fronted cabinet. They look delicious. I love simplicity in cafes. Gimmicky decorations and fussy menus with too many items leave me cold. I much prefer when a cafe marks out its own simple territory and formula and then sticks to it with style and consistency. 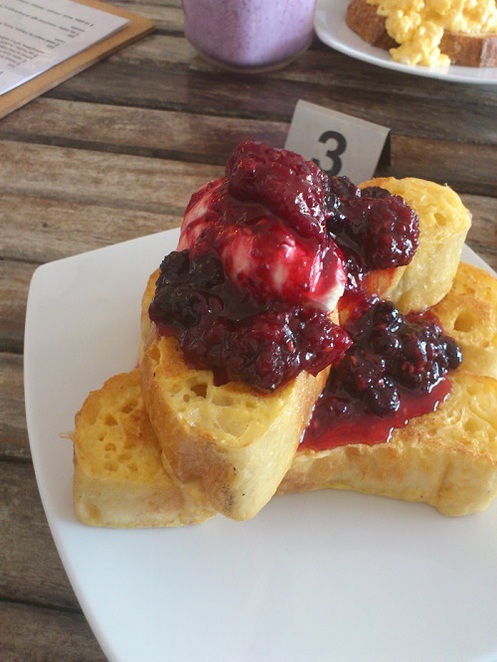 Ananas is a great little find delivering excellent, uncomplicated, value-for-money breakfasts in the midst of an interesting and diverse Western Suburbs dining area that is really hitting its straps. For more information visit their website or Facebook page or just go and give them a try. You won't regret it. The French toast looks to die for. Yum, agree with Bryony. This place looks great!